I find the "grey areas" on a chart fascinating; the areas where our bias or premise start to show signs of breaking down and our decisions are clouded by the uncertainty that prevails at the hard right edge of our screen. This is where real learning happens! Where your knowledge, skills and attitude are pushed just beyond their limits. The YTC Price Action Trader provides a process which I use to analyse price as it changes bar-by-bar (Volume 2, Sections 3.5 and 3.6). However the above chart gives some insight into how I think on a scale above the bar-by-bar level. My expectations are generally for continuation of the prior type of price movement. If the prior pullbacks within this trend were short and sharp, then I'd expect this pullback to be the same. If the prior pullbacks were long and extended, then I'd expect the same. So in this case, I'd be looking for a pullback of about the same percentage depth as the prior pullback BC. The fact that DE extended beyond that prior depth indicates that something has changed. The market is no longer acting in the bearish manner expected of a trend with strong extensions AB and CD. When a pullback acts in a manner which raises doubt as to the trend's ability to continue, I won't be too quick to abandon that trend. But I won't be taking the first pullback entry signal. The extended pullback will have given counter-trend traders some hope, so they're likely to act with orderflow that opposes my trade. I want to see a better entry, that comes from a second push higher which ideally traps and rapidly reverses on the counter-trend traders. 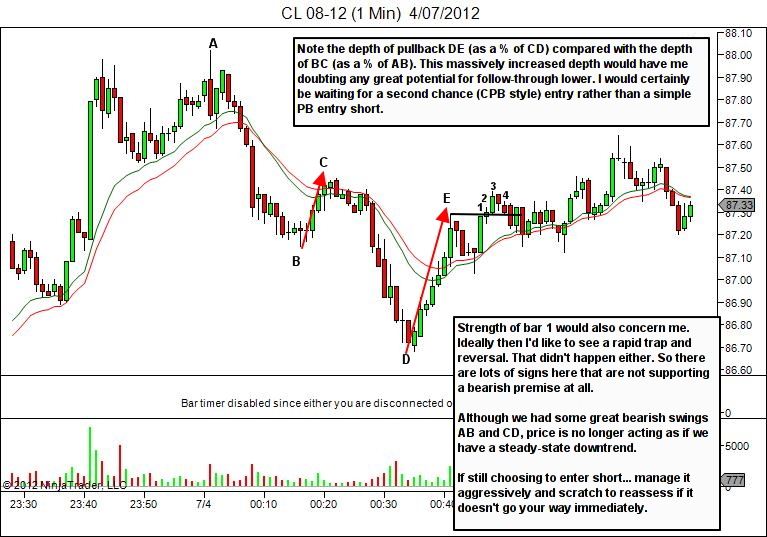 This second chance entry would be a great entry short. Unfortunately in this case it didn't provide a confident trap either. 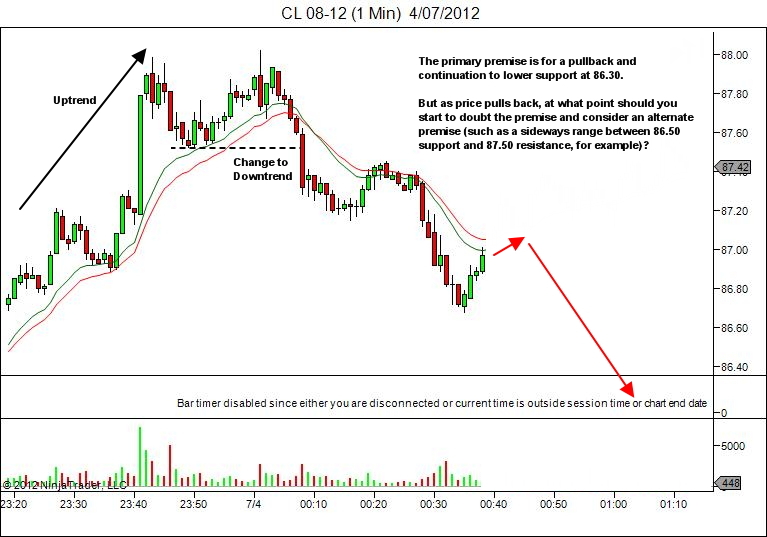 Price was not acting as it should if the premise for a continuation of the downtrend were still valid. Certainly an entry short on the break of the lows of candle 3 or 4 would have provided sufficient opportunity to scratch for either breakeven or a small loss. But the best bet was to stand aside. When price does not do what I anticipate, I won't immediately abandon my premise. But I will demand stronger proof that I'm right (and preferably proof that traps and stops out those who opposed my premise). If that stronger proof does not appear, it's time to get away from the chart for a few seconds (at least) and come back with a fresh mind. You'll need to reassess what is happening on your charts. Unfortunately at this stage in my trading career there are a lot of grey areas. On a positive note there are plenty of opportunities for learning. Progress all depends upon the quality of our recording and reviewing processes. ie. Volume 5 where it talks about the Trade-Record-Review-Improve cycle. Impossible to say as trade management decisions depend very much on context. They’re never just “referring only to this chart”. Obviously I’d love to say I’d take the exit as soon as price broke above the candle high, but this is all hindsight speculation. This looks like a V shape reversal and in such scenarios I find it very difficult to manage the trade and give back most of the gains as I dont rely on lower TF. Yeah, as I said I’d love to say I’d get in on a break of the lowest candle high. But the v-turn nature of the price action makes me think I wouldn’t. It’s all speculation though. I can’t say where I would get out. Hindsight decisions are ALWAYS suspect. Perhaps on a break back above the swing low from 23:40? Really, it would depend on the decision making at the time which considers many other factors not visible in one small chart sequence. Perhaps I also would have given back all the profits?? ?